Mississippi Delta bluesman R.L. Burnside has, in the last decade, become of the darling of a younger generation of blues fans, many of whom know him only through his later Fat Possum recordings or the shout-fests with rocker Jon Spencer and his Blues Explosion. 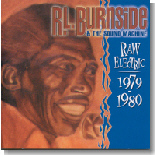 Raw Electric, 1979-1980 collects a series of recordings, most never before issued, which capture R.L. with his family band. Most of the cuts were recorded in the Burnside living room, which often doubled as a neighborhood juke joint for the folks around Independence, Mississippi. In short, this album is just plain wonderful. It's qualifies as a surprise for a number of reasons. First, it's astonishing to think that music this good came from a series of practice sessions, and noted ethnomusicologist David Evans, of Memphis State University, filed the tapes away and forgot about them for 20 years. Second, the sessions at Burnside's house were frequently marred by malfunctioning equipment, drunken performers, rowdy audience members, etc. Yet, the music on these sessions is as alive and vibrant as anything that will come out of a studio this year. This is raw, unadulterated blues, and the closest that most of us will ever come to a Mississippi house party. The songs here were done with the audience in mind, with covers of some of the standard blues and soul songs of the day. Sound quality is better than it really should be and the crowd noises are unobtrusive, in fact often adding the right touch at just the right time. For example, there's the sound of a baby crying in the middle of "Pretty Woman," and it just seems to fit. Burnside is backed by his sons Joseph and Daniel on most of the tracks, assuming that there were enough working guitars that particular night. Son-in-law Calvin Jackson plays drums, providing excellent accompaniment throughout. In fact, the highlight for me came on an instrumental version of "Sitting On Top Of The World." While Burnside plays unusually subtle guitar, Jackson backs him with a marching band drum beat, undoubtedly learned from his time spent playing in one of the Mississippi hill country fife & drum bands. Another hot number with the whole band is an original, "Well, Well, Well," with the Burnside brothers taking the lead on guitar and Jackson jumping in with tough drum rhythm. R.L. does some of his most spirited singing on the Howlin' Wolf number "How Many More Years." This one features Burnside accompanying himself on guitar. The version of "Rolling and Tumbling" barely gets everyone started at the same time before the rest of the band jumps in on this frenetic workout, driven along by Jackson's primal, rhythmic drumming. Neighbor Robert Avant plays guitar and sings along with Burnside, adding a real spontaneous feeling to the song. The disc ends with a live recording done at the University of Memphis, an excellent version of Burnside's spirited "Jumper Hanging Out On The Line," which he also recorded on a 45 for High Water Records. Despite the rough nature of these recordings, the occasional feedback, the crying baby, the raucous audience members, and the sometimes out of tune guitars and barely workable amplifiers, you won't hear any other blues as authentic and energetic as the 17 cuts on Raw Electric. Great stuff!